The battle for Lord Stanley’s cup resumes tomorrow night. It’s kind of amazing that the 4 teams that remain have all won the cup in the last 4 years. If you’re a fan of any of the teams that remain, you’re on a pretty good ride. Pittsburgh steals Jerome Iginla right from under the Boston Bruins at the trade deadline. We all thought Iginla was headed to Boston, as did Boston management. Boston then made a trade to bring Jaromir Jagr, one of the most hated ex-Penguins, to Boston after the Iginla deal went south. Matt Cooke has appeared to have ended Marc Savard’s career with hit to the head. This is a series that will feature a high-octane, up-tempo Pittsburgh squad against a very physical and aggressive Boston squad. On paper, this is going to be a great series. Both are coming off a semi-final series that was pretty much a piece of cake. Don’t expect this one to be. If Pittsburgh is going to win this series, it’s going to be because of their speed and ability to score a lot. 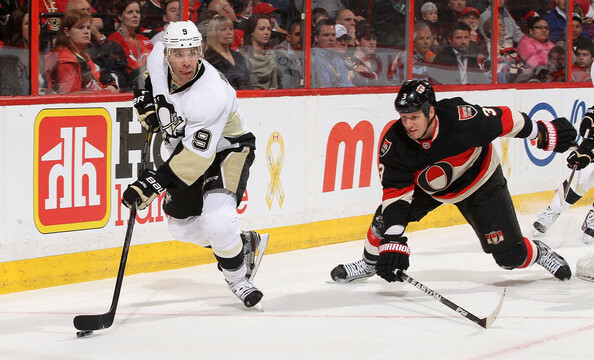 Malkin, Crosby, Kunitz, Neal, Iginla, Morrow and Dupuis give the Penguins A LOT of depth. Paul Martin has looked decent in the playoffs and the Kris Letang isn’t a Norris Trophy finalist by accident. Tough team to beat, especially since they are on a roll. If Boston is going to win this series, they will do so because their 4 lines are going to wear down the Penguins. They come at you in many different ways and are relentless on the puck. The one thing we saw in the Rangers/Bruins series is that the Rangers defense NEVER got a rest because the Bruins had all 4 lines working. If they can do that against the Penguins, it could mean problems for the Penguins defense. While Vokoun was solid against the Senators (and the Islanders when he came in) I’m still not sold that the Penguins don’t have a goalie issue. I don’t see this series being anything less than six games and I do think there will be some issues in goal for Pittsburgh (whether they are bad enough to make another change, I can’t predict) but I also believe that Pittsburgh’s quickness with the puck will keep Boston on its heels, much like Toronto did but the difference in this series is that Pittsburgh has a lot more skill than Toronto. I pick Pittsburgh in 6 maybe even 7. 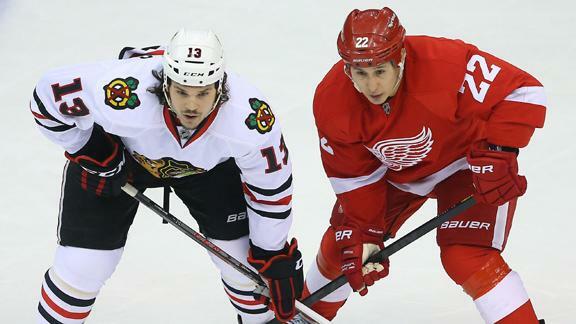 The Blackhawks are coming off an emotional 7 game series against the Detroit Red Wings. Down 3-1 in the series, they battled back. The Kings are coming of a 7 game series against the San Jose Sharks but it wasn’t as emotional as the Hawks/Wings series. The Hawks had an impressive regular season and pretty easy first round matchup against a very inexperienced Minnesota team but something is just missing for me when it comes to Chicago. They have a lot of depth but I haven’t felt that a lot of that depth is playing to its potential. Detroit wasn’t a very strong team on the blue line and the Hawks struggled against them. If Chicago is going to win this series, then they are going to do so because they’ve figured out a way to solve Jonathan Quick (something that wasn’t done last year and so far this year.) Chicago has the depth to do it but Toews, Kane, Sharp and Hossa need to play like they did in the regular season. If LA is going to win this series, they’ll do so by being great on the road and continuing to be great at home. Quick is no doubt the best player of the 4 remaining teams and as long as he continues to be that, LA will certainly have an advantage in this series. I’m actually going to say that LA rolls right over the Hawks in this series. They are big, they are mean, they have excellent defense and goaltending and I see no reason why the Kings can’t win in 5 on their way to their second straight Stanley Cup Final. This is the series I am most looking forward to. These don’t appear to be the San Jose Sharks we are used to. By that I mean it’s no longer a team that hinges on the success of Joe Thorton and Patrick Marleau. Sure, they still play an important role on this team but I look at the Sharks as a team that now belongs to Joe Pavelski and Logan Couture. The Sharks easily handled the Vancouver Canucks in round one and head into the Conference Semi-Finals a well-rested and confident bunch. 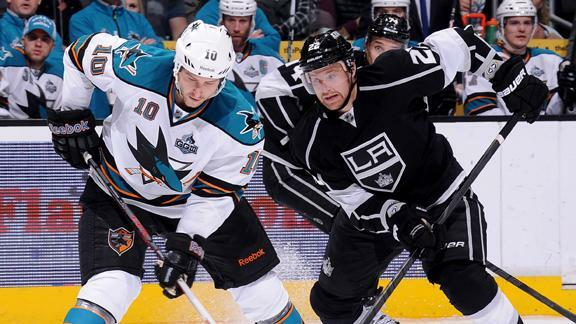 Let’s not give the Sharks $200 for passing “Go” just yet. These are the Kings, the king of all Kings if you will, the defending Stanley Cup Champion. Throw out the first two games against the Blues in the first round and you could say the Kings handled the Blues pretty easily as well. After a little bump in the road to get things started, the Kings rattled off 4 straight wins to send St. Louis home….again.